The first day of our Heritage trip to Poland was a bit of a whirlwind for all of the students participating. After a long, exhausting flight, we landed in Warsaw at 1:00 pm, where we promptly rushed to the old Jewish cemetery in Warsaw. There we learned a lot about the grand legacy of Polish Jewry, beginning in the 15th century, and how it met its unfortunate end after the Warsaw Ghetto burned down during the Warsaw Ghetto Uprising. The first part of our exploration celebrated the rich history of Warsaw Jews. We visited tombs of influential Jews of Warsaw throughout its long history, including י. ל. פרץ, a prominent figure in Yiddish literature and an author whose works the students know quite well, and L.L. Zamenhof, who sought to unite the world through his creation of a universal language, Esperanto, but whose dreams were never realized. 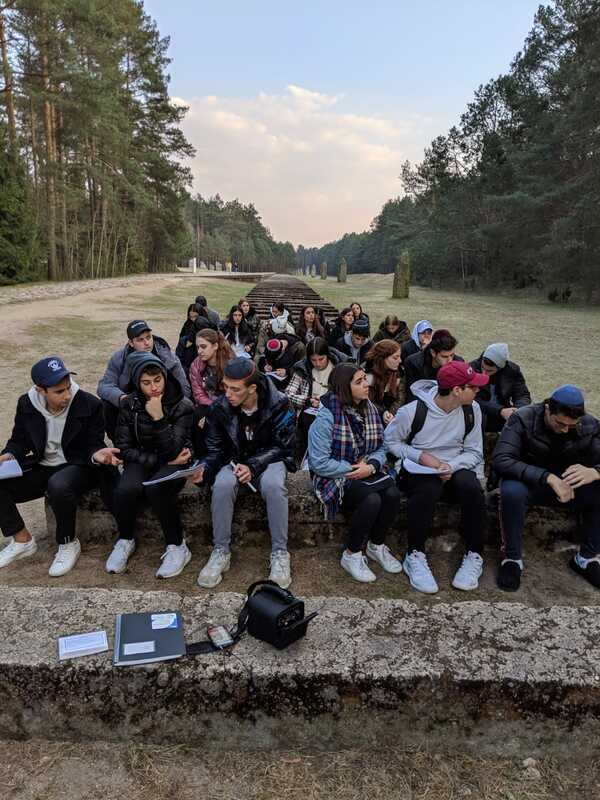 The next part took a darker turn, as we recounted the creation of the Warsaw Ghetto and the horrors that occurred within as they related to the cemetery. We saw the gravesite of Adam Czerniaków, the head of the Judenreit, which governed the Warsaw Ghetto. This man had to make what Rabbi Lubner called "choiceless choices," in order to decide who would be deported to meet the Nazi's quotas for that week. However, his actions placed a heavy burden on his soul, and he later committed suicide. We concluded our visit at the site of the mass graves where nearly a hundred thousand Jews were buried towards the end of the war, when the rate of deaths from disease and starvation was too high for the חברה קדישה to keep up. 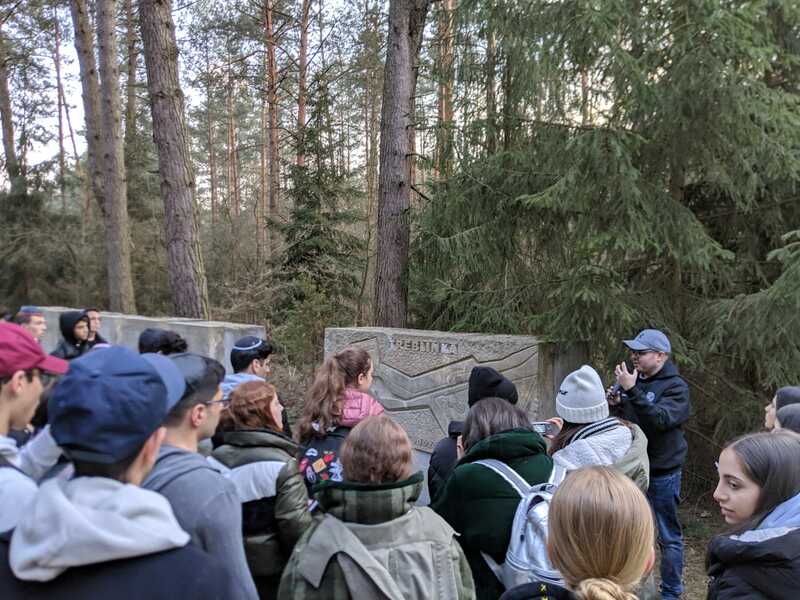 We then boarded the bus again and headed for the death camp Treblinka II, taking the same journey as the nearly 800,000 Jews who were murdered there did. While the camp itself was torn down towards the end of the war, powerful monuments have been erected in its stead, such as heavy stone pillars marking the boundaries and concrete slabs along where the rail lines once stood. In the center of the camp, approximately where the main gas chamber once stood, stands a massive stone , the top carved with stylized piles of bodies, to commemorate the atrocities of the camp. 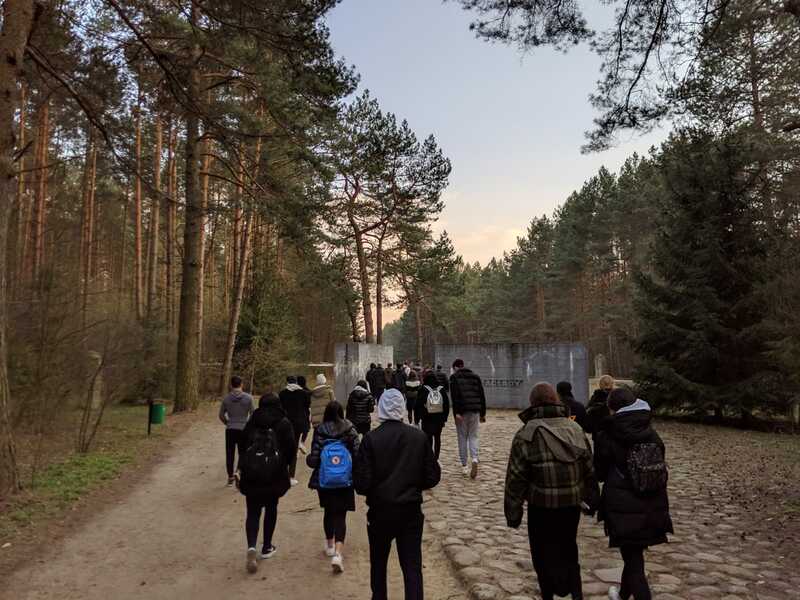 In the surrounding clearing are 17,000 stones of varying sizes and shapes, to symbolizing the roughly 17,000 Jews killed in the camp each day at the height of its operation. Each stone is inscribed with the name of a town, village, or city from which the Jews killed at this camp came, serving as a powerful reminder of the meaning of community to the Jewish nation.